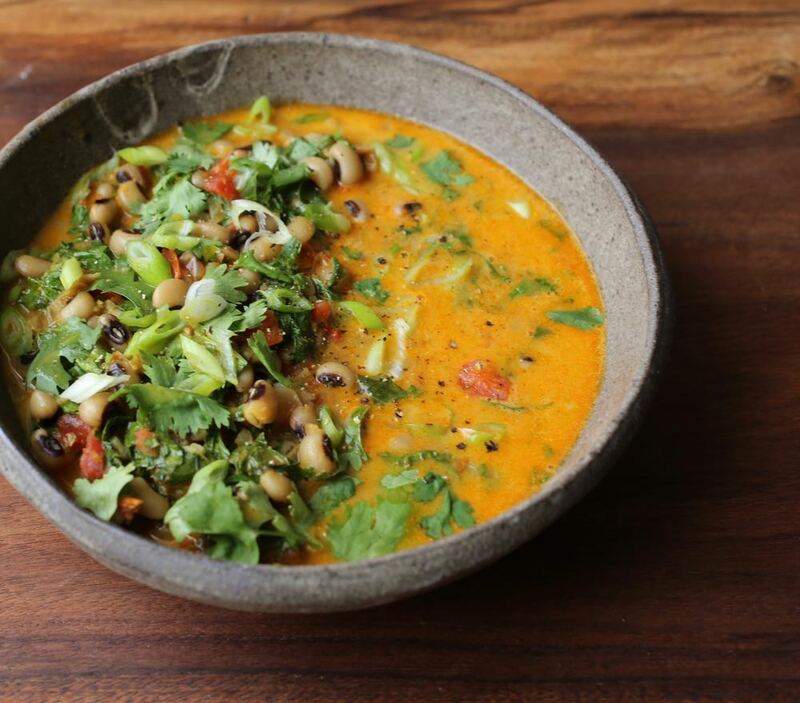 The black-eyed peas dish from January (for New Years Day), was a stew made with a blend of spices inspired from Indian cuisine. This time I “traveled” to Africa and flavored my dish with berbere (an Ethiopian red chile spice blend), ginger, turmeric and coconut milk. 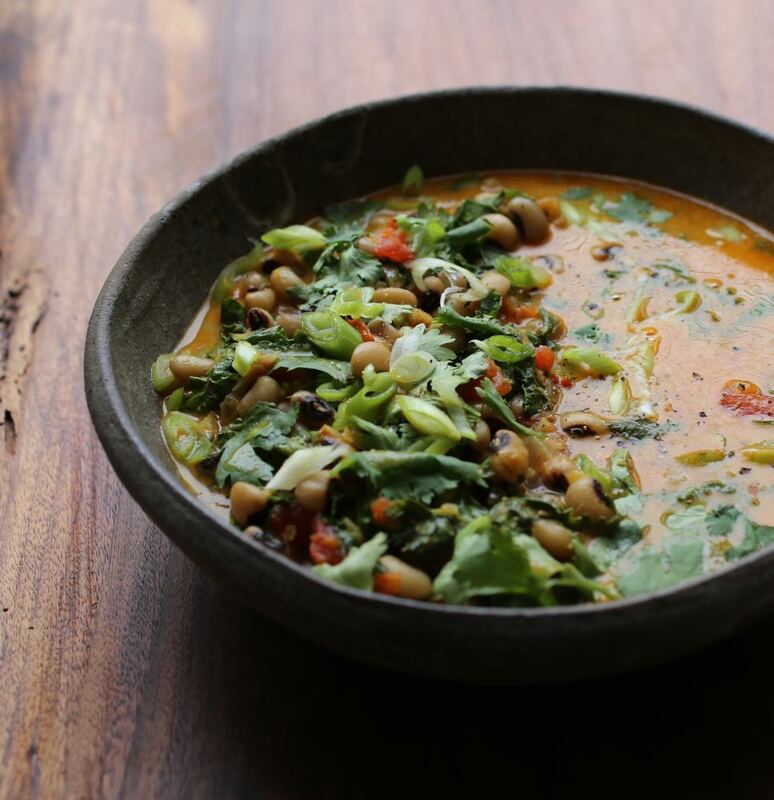 Creamy and complex, this recipe is adapted from Ethiopian/Swiss celebrity chef Marcus Samuelsson. Turnip greens are a bit bitter in flavor so if you use them I’d suggest adding only a cup. You could also substitute turnip greens with kale, spinach, chard or collard greens. Also, I prefer to use dried peas (I think they taste better), but if you’re in a pinch for time feel free to use canned black-eyed peas. This dish can be eaten with farro, barley, rice or any other grain of choice. In a large saucepan, cover the peas with plenty of water, add bay leaf and bring to a boil. Simmer, covered, over moderately low heat until tender, about an hour. After about 40-45 minutes, add a generous pinch of salt. Continue to cook until tender then remove from heat, let stand for 5 minutes, then drain well. 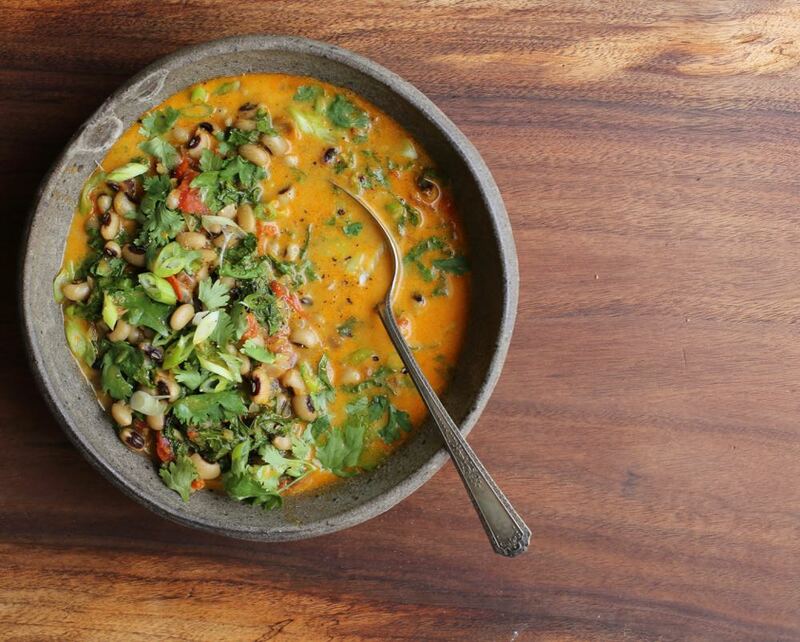 If you’re using canned black-eyed peas, you can skip this step. Simply rinse and drain canned black-eyed peas and proceed with the instructions below. Meanwhile, heat oil in a large saucepan. Add the onion and cook until tender, then add ginger, garlic, chile and salt and cook over moderate heat, stirring occasionally, until softened and just starting to brown, about 10 minutes. Add the berbere and turmeric and cook, stirring, until fragrant, about 2 minutes. Add the tomatoes and cook, stirring, until softened, about 5 minutes. Stir in the stock and coconut milk and bring to a boil then simmer over moderately low heat, stirring occasionally, until the tomatoes break down and the sauce thickens a bit, about 20 minutes. Add the peas to the sauce and cook over moderately low heat, stirring, until the peas are lightly coated, about 10 minutes. Adjust consistency by adding more stock and/or coconut milk. Taste and adjust seasoning (salt, berbere, etc). Fold in greens, then cilantro and scallions. Garnish with cilantro and scallions and serve. Sprinkle with freshly ground pepper. *Note: depending on the level of heat I want, I’ve made this dish with and without the habanero pepper. Also Start with a small amount of berbere then you can increase if preferred. What a beautiful stew. I like the idea that food can bring prosperity. Lentils are known for that in Colombia. I like the spices you use here. I’m putting this on my “must try” list. Great. I didn’t know that about lentils, thanks! This dish is something I’ve cooked several times at home since last year, always making adaptations based on what I have at home. I hope you like it! I also love the flavor and heat of Berbere. It’s a versatile spice. Keep me posted on what you think! Lentils are also supposed to bring prosperity in Italy, where they are eaten for the New Year’s (traditionally with cotechino sausage). 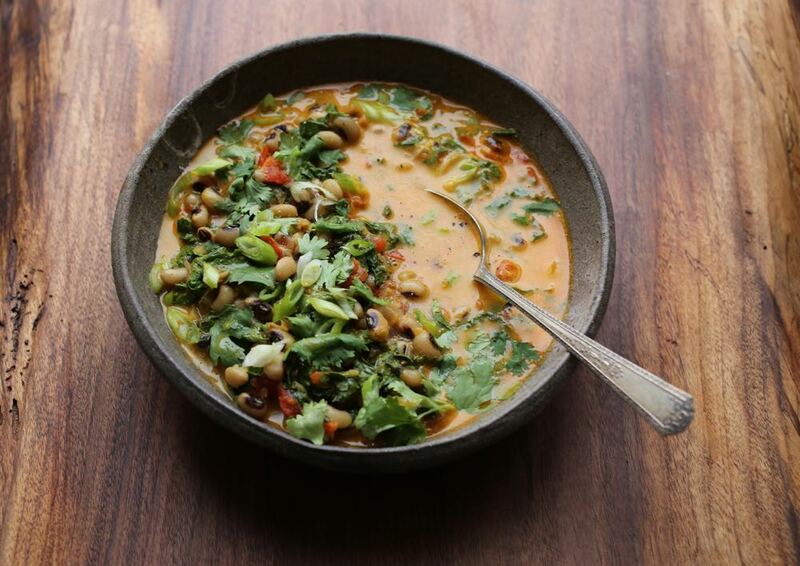 This is a wonderful stew, I love the spices and colors, AND the use of turnip greens, of which I have tons since receiving my share of veggies from the farm. I never really know how to use them, but I hate wasting. They usually end up in any random soup, but this stew is special! Hi Darya, thank you for your note. How interesting that lentils are considered to bring prosperity in both Italy and Colombia, as Amanda mentioned. I really love lentils!! I’m glad you like the spices here, I imagine lentils could be substituted for the peas, if preferred. After making this dish I still had some turnip greens on hand so I used them in a toasted farro dish I made today. I enjoyed it but the pictures didn’t come out as I wanted. It had a Middle Eastern flare as I used tahini and pomegranate molasses for added flavor. I will look through the pictures again later. If any are good enough to share, I’ll post them here. Thanks again!